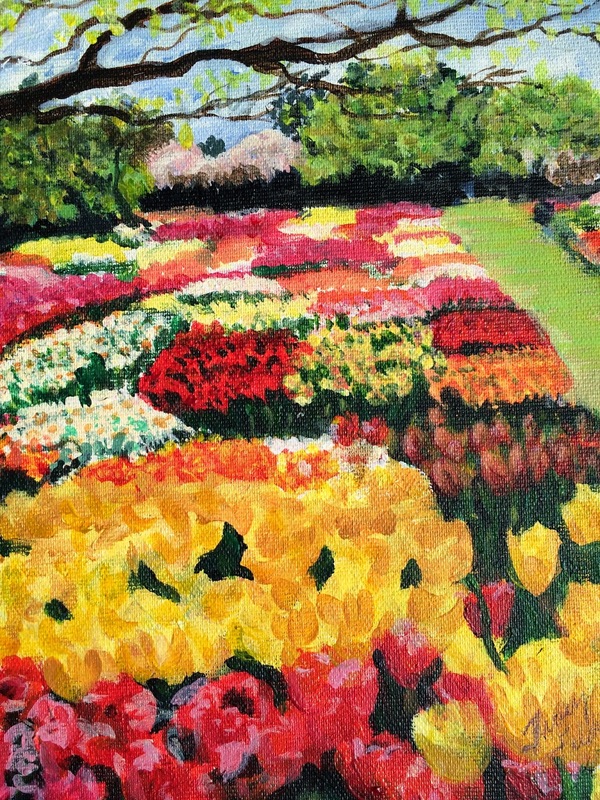 Spring Impressions -- Longwood 2014, 8 x 10"
I love the patchwork feeling of these tulip gardens at Longwood Gardens in Kennett Square, PA. They reminded me of a patchwork quilt. As with the first piece of this series, the small scale of this work helped me be willing to move away from wanting to paint a totally representational rendering of what I saw. But I couldn't resist adding more representational versions of the dark linear branches that spread over the near floral patch because they added another needed dark value and their thin linearity beautifully complemented the shapes within the tulip and daffodil beds. I'd love to hear your impressions. This work is also up for auction on the Daily Paintworks site. Bidding will start at $30. If it doesn't sell at auction, I'll include it in the small works section of my next show, for considerably more than the starting bid. Click here, or on the Daily Paintworks icon to the right to get to my gallery and bid. Back In the World of the Sharing!